Before the shooting had even stopped, teenagers hiding at their Florida high school were talking about gun control. Within days, they had launched a crusade against gun violence — one that will result in a nationwide series of protests Saturday. In taking up the fight, the students have joined forces with liberal organizations that have been pushing for years for tighter gun laws. That’s led to criticism that the youngsters’ cause is less spontaneous than it seems and that they are being used as pawns. Such suspicions infuriate the teenagers who have worked furiously since last month’s massacre at their Marjory Stoneman Douglas High School in Parkland, where 17 people died. They say they welcome financial help and assistance with certain basic, organizational tasks — after all, said Parkland junior Cameron Kasky, “I’m 17. I can’t rent a hotel room” — but that the ideas behind the movement remain all theirs. He said as proof of his group’s independence, it has turned down requests by some adult supporters to address Saturday’s main march in Washington, preferring to reserve all speaking slots for youth. Alan Gottlieb, founder of the Second Amendment Foundation, contended the movement has been misrepresented as the spontaneous product of traumatized students. Longer-established gun control groups supporting the march chortle at the notion that they are the ones really in charge. Kasky recalled how in the days after the attack people kept asking him if George Soros was funding them. He said he didn’t even recognize the name and had to look it up to find that they were referring to a liberal billionaire whose funding of several progressive groups is a favorite of conservative conspiracy theorists. Likewise, Kasky laughed off attacks connecting the students to Nation of Islam leader Louis Farrakhan, who has been accused of anti-Semitism. The criticism came because the teens accepted help from the Women’s March movement to organize student walkouts last week, and the co-president of the Women’s March had met with Farrakhan. Kasky noted that most the students in his group are Jewish. Parkland students are in no way going it alone. The raw emotion and outrage they expressed over social media and at rallies after the Valentine’s Day attack electrified supporters of gun control and opened wallets. They have raised more than $4 million to support the more than 800 scheduled marches, including donations from celebrities such as George Clooney and Oprah Winfrey, as well as support from groups like Everytown for Gun Safety, the gun control group founded and funded by former New York mayor and billionaire Michael Bloomberg. In groups like Everytown, the Parkland teens are getting support from a well-financed gun control movement that sprouted up after the Sandy Hook massacre in 2012, when 20 Connecticut first-graders and six adults were killed. After gun control legislation failed in the U.S. Senate, activists decided they needed to create a counterpart to the National Rifle Association’s combination of financial heft and grassroots support. The Parkland students have been quick to seize their moment. First, they went to Tallahassee to lobby for gun control legislation at Florida’s Capitol, where they were joined by Giffords and her husband, former astronaut Mark Kelly. They traveled to Washington, met with senators and parents of children killed at Sandy Hook and got advice on activism from Rep. John Lewis, the Georgia congressman who was a stalwart of the civil rights movement. A pro bono attorney helped them set up a nonprofit to handle donations. They even have their own app. What happens after Saturday’s march? Kasky said the students plan to launch a get-out-the-vote campaign targeting young voters. The students aren’t the only ones benefiting from the energy they’ve injected into the gun control movement. Feinblatt said Everytown has received nearly 100,000 small donations since Parkland. Everytown and Giffords’ organization are helping fund some of the “sibling” demonstrations around the country Saturday. The main march’s web page directs supporters who want to make a tax deductible donation to an Everytown fund. Gottlieb, of the pro-gun group, said that the Parkland teens represent only one side of the debate among their generation and that they’re being lionized by the media at the expense of peers who disagree. 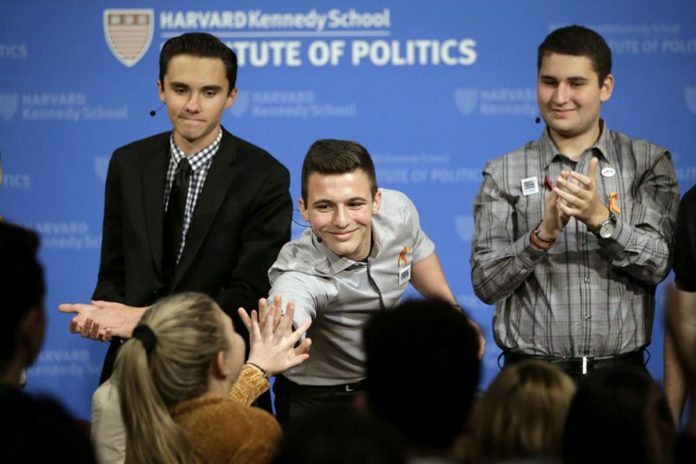 In fact, that’s helped some pro-gun teens start to mobilize, he said: Youth memberships in his relatively small group have increased twelvefold since Parkland. “There’s movement on both sides of the equation,” Gottlieb said.